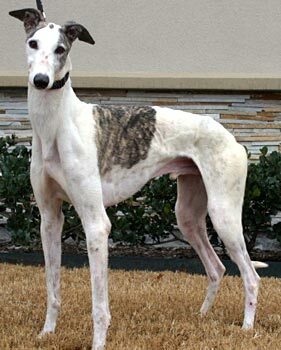 Whiskey, aka Whiskey Lullaby, is a 4½-year-old white and brindle male born July 23, 2003. His sire is Crawdaddy, making his grand sire Gable Dodge, and his dam is Chikatilo. 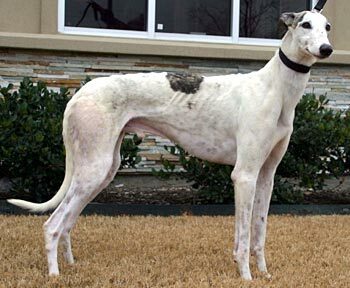 Whiskey is a Texas-bred greyhound competing all of his 66 races here in Texas, starting January 15, 2005, at Gulf Greyhound Park in La Marque, and finishing December 26, 2007, at Valley Race Park in Harlingen. Whiskey is a personable and happy boy who is ready to find his forever couch! Whiskey is not cat tolerant but is good with small dogs. 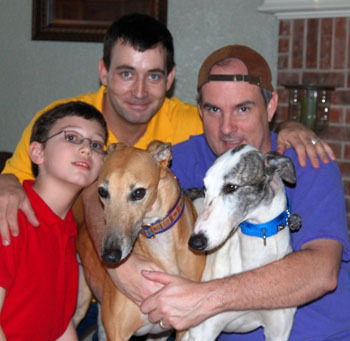 Whiskey with his new family including his fur-brother, GALT greyhound, Logan. Missing from the picutre are a fur-brother and fur-sister (Sheltie mixes).